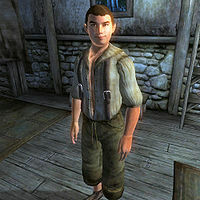 Betto Plotius is an Imperial commoner living in Leyawiin with his wife Julitta. They both share an almost racist pride in being Imperials and would be perfectly happy to see all the Argonians and Khajiits run out of town. Every morning at 6am, they'll get out of bed and spend the next four hours in the house before leaving for a two hour breakfast at the Five Claws Lodge. At midday, they both take a stroll near the house for sale before going their separate ways at 2pm. Betto keeps wandering the area until 6pm, where he returns to the house for dinner. Once done, he takes an evening walk to the towns popular gathering spot at the bottom of the stairway leading to the Blackwood Company hall. After two hours, he heads home to his wife and bed, this time picking a different route, getting his feet wet in the city pond on the way. If it's raining outside, he will skip all of his outdoor activities and head back to the house. The exception to this schedule occurs once the Drunk and Disorderly quest is initiated. To avoid the drunken, restless Fighters Guild members terrorizing the Five Claws Lodge, Betto and Julitta will skip their 10am breakfast and stay in the house. His choice of clothing is a standard lower class affair: oiled linen shoes, sack cloth pants, and a shirt with suspenders. He carries his house key and a small amount of gold. When you approach him, he will introduce himself and grieve for a moment: "Betto Plotius. I'm a faithful servant of Leyawiin and the Emperor... Gods rest his soul." When you ask him about Leyawiin, he will share a few of his controversial opinions: "I've lived in Leyawiin all my life, and I must say, the Count has found himself a pretty little bride...and a smart one, too. We need some law-and-order... bring in the Legions. 'Leyawiin for the Imperials,' I say. No sense coddling those Renrijra Krin bandits." Esta página foi modificada pela última vez à(s) 05h18min de 20 de outubro de 2015.